My product control panel displays the message Recovery Mode. What should I do? You need to update the printer's firmware. 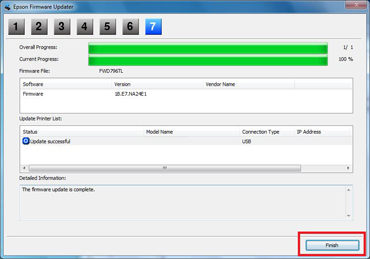 You can download the firmware for your product from the Downloads tab. Click Firmware Update under Firmware, then click Download. Follow the on-screen prompts to download the firmware. Windows: Run the firmware downloaded file epsonXXXXX.exe. 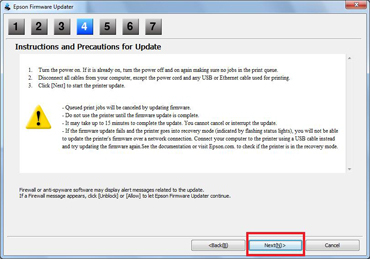 Mac: Open the firmware downloaded file epsonXXXXX.dmg and run Epson Firmware Updater. When the following screen appears, connect the USB cable directly from the printer to the computer, then click Next. Note: Do not unplug, power-off, or attempt to use the printer during the update process. Click Start to begin the firmware update. 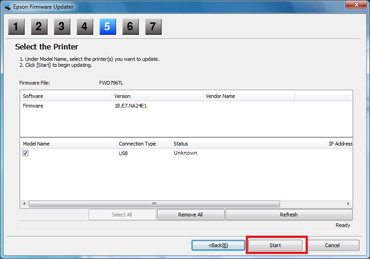 The firmware update is complete when the printer restarts. Note: Unplug the USB cable if your printer is set up via Ethernet or wirelessly. Published: Mar 18, 2014 Was this helpful​? Thank you for the feedback!